New Concepts in Molecular Sieve Membrane Preparation - What can we learn from Zeolite Membrane Preparation for MOF Membrane Synthesis? The urgent need to reduce not only pollution, but energy use and energy waste is leading to an increasingly wider diffusion of environmentally friendly membrane systems. With the introduction of membrane operations for new demanding applications comes the need of developing tailored membrane materials with unprecedented performances and resistance to temperature, chemicals and solvents, at an affordable cost. Today, it is common practice to specifically engineer and tailor-make new polymeric, inorganic and hybrid membranes which meet the requirements of a given industrial application. It is trivial but new materials with improved properties are required to override some limitations in applications. Especially in membrane science novel substances may open up the possibility to improve the membrane stability, quality, and precision, therefore, adding more chances for a largely improved process control and so attaining the goal fast. However, even with excellent new materials, some questions have to be solved: How to engineer a membrane material and make real membranes for real applications? 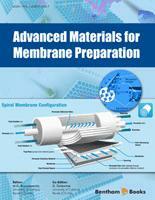 What is the state of the art of the materials sciences research behind such membrane engineering? What are the perspectives of the materials science of synthetic membranes? This book is written with these questions in mind. How membranes are employed in natural gas treatment, for the separation of organics, incorporated into fuel cells, and high- and low-temperature catalytic membrane reactors are just some of the topics covered within this volume. The e-Book edited by Dr. M. Giovanna Buonomenna and Dr. Giovanni Golemme is of interest for not only specialists in membrane science and technology but also graduate students and researchers in chemical engineering, chemistry and materials science since Advanced Materials for Membrane Preparation links academic knowledge to both research know-how and the avant-garde industrial application of advanced membrane materials. The problems related to the greenhouse effect and the scarcity of fossil hydrocarbons – the reservoirs of which will reduce dramatically during this century – impose a conscious use of energy in each of the three major sectors of energy consumptions (industry, transport and domestic uses) which roughly adsorb one third of the global demand. In 30 years from now the increase of the world population and of the average standards of life will cause a non-sustainable explosion of the energy demand, if current energy-intensive technologies will not be phased out. The availability of cheap and performing electrolyte membranes, the heart of fuel cells, would drastically increase the efficiency in the use of fossil fuels and facilitate a wider diffusion of renewable energies through the so-called hydrogen economy. As of today, the 15% of the energy produced worldwide is employed for separation processes, and most of them are inefficient. Membrane operations are needed to reduce not only production costs but also equipment size, energy utilization and waste generation, in other words they are powerful tools for process intensification. Seawater desalination is a successful example: since membrane operations in integrated systems are 10 times more energetically efficient than thermal options, they represent the cheapest and less polluting solution for the supply of freshwater in desert and remote areas. The early polymers used for the preparation of reverse osmosis and gas separation membranes (i.e. cellulose acetate and polysulfone) can treat moist streams or aqueous solutions, but cannot tolerate organic solvents, high temperatures and aggressive chemicals, and are unfit to operate in the harsh environments typical of the oil refining and the chemical industry. For this reason new tough materials are sought in order to expand as much as possible the province of membrane operations. The preparation of tailored synthetic membranes and their utilization on a large industrial scale are a recent development which has gained a substantial importance due to the large number of practical applications. Today, membranes separate liquids, gases and vapours, recover valuable compounds, separate, purify and concentrate juices, milk, serum, broths in the agro-food and drug industries, and they are key components in energy conversion systems. The modern membranes used in the various applications differ widely in their structure and function and the way they are operated in the different membrane processes. Therefore, several excellent books focus on certain aspects of membrane science such as the theoretical treatment of transport, engineering aspects of membrane process design, membrane preparation and large scale production. This book provides to scientists and students a short but reasonably comprehensive overview of the most recent research strategies for the design of membranes based on advanced materials for specific applications. Chapters written by experts will make the reader acquainted with a variety of topics ranging from new membrane materials (inorganic oxides for gas separation, zeolites, metal organic frameworks, perovskites for oxygen production, carbon nanotubes, mixed matrix membranes, ionomers for fuel cells, perfluoropolymers, block copolymers) to processes (membrane reactors, aqueous and solvent resistant nanofiltration, pervaporation) to simulation tools of transport of molecules in carbon nanotubes and membranes for fuel cells. The goal of the authors is to offer an up-to-date understanding of the materials science of membranes in various applications and of its present and future technical relevance.